Coloriasto: Photo-Trichromatic Printing. Part II. Chromatic Clock Dial. Photo-Trichromatic Printing. Part II. Chromatic Clock Dial. It will be useful to artists, colour printers, decorators, and, in fact, to all who work with colours, to remember which are contrast or complementary colours, as the case may be, and how to produce certain saddened colours or tints which may be required. As everybody is almost sure to have a watch or clock near at hand, it occurred to me that the clock face might be turned into a useful chromatic circle, and if once the position of the pure and broken colours be committed to memory, which should not be a very difficult feat, they may easily be called to mind in their proper position relative to the figures on the clock. 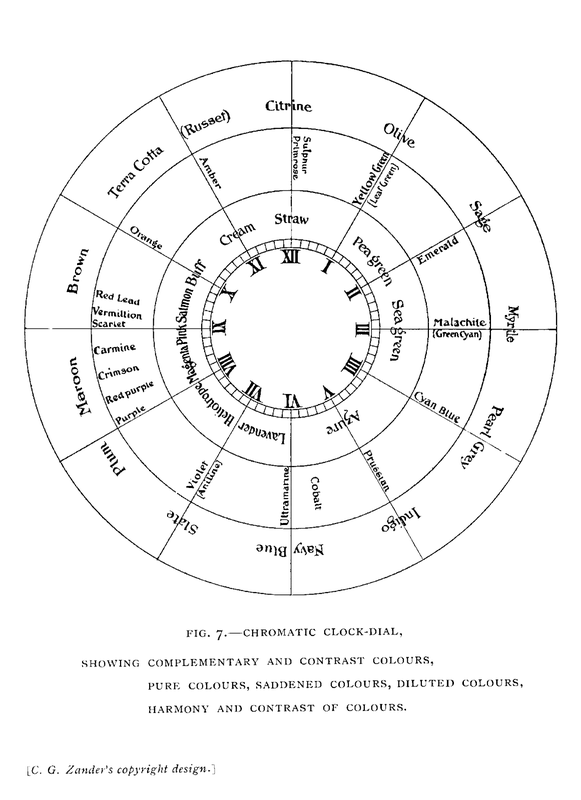 I have taken Rood's excellent contrast diagram for a guide, but found it necessary to slightly modify the position of the colours so as to make them correspond more readily with the figures on the clock-dial, and to be remembered more easily. My chromatic clock-dial is intended more for practical every-day use than for scientific purposes. I placed yellow, being the most luminous colour of the spectrum, at the top at XII. of the clock, and as we proceed downwards to the right, the colours lessen in luminosity till we reach VI. (ultramarine blue), thence as we proceed upwards to the left through violet, purple, etc., the luminosity again increases till we reach yellow, our starting point. Outside the pure hues I have placed the saddened colours, which may be produced by decreasing the luminosity of the pure colours, i.e., by the admixture of neutral grey pigments, whilst inside I have placed the names of the tints which may be produced by adding white to the pure hues.